I don't recall exactly what it was that brought up the memory recently of writing my high school graduation speech... more than a few years ago. I laughed at the thought as I recalled how I had done a Yahoo search to get ideas back then for a simple graduation speech. I remember asking what exactly do you say in a graduation speech? Follow your dreams. Road to Success. Finding your path. I probably still have a copy of my speech somewhere, but I'd prefer not to reread that at this time. I remember where I was in life at this point. I remember it was a time of reflecting, looking back over the past few years at the accomplishments I had made, and the anticipation of the "empty pages waiting for me to fill" in my future. I also included a funny joke about a goal to wear hot robes and silly hats, but not everyone appreciated my humor. I gave that speech a little over 18 years ago. Fast forward to where I sit today, and only one part of my life has been how my 18-year-old-self planned it. Dreams are good. Goals are better. But praising God wherever He leads you is best. So many sweet friends and family members have recently graduated either high school or college. I want to sit them all down individually, pat them on the hand, and simple smile. But deep down I would want to tell them to simply follow Jesus - always -in everything. At 18, those very words did not have the same meaning as they do for me today. I remember those days very well. I remember the uncertain feeling of not knowing where life was leading me, what plans the Lord had for my life. Many of my friends knew already what they were going to do with their lives, God had already called them into the ministry. But me... I just knew I was going to college to get a degree to hopefully make a decent salary. I liked a challenge, so I went into a field that, at the time, was predominantly full of men - computer science. College graduation came and went. I had successfully completed college in 4 years and had a full-time job in my field. That same summer I married my high school sweetheart. It's ok, you can go ahead and say "Awww." Marriage changes things. But KIDS... they turn life's plans UPSIDE DOWN. A few months after our second anniversary we had our first child AND moved into our first house that we built. A few months after that... I quit my job to stay home with our child. This was NEVER part of my plan. Kids weren't even part of my plan when I was 18... but even still, being a stay at home mom, - NEVER IN A MILLION YEARS. NEVER. What do they always say about saying never??? What can I say... God slowly began to change my heart. Once I was married, I knew I wanted to have children. I am a homeschooling mom to two wonderful kids who love the Lord. I have a wonderful husband who works hard to support our family as we follow God's will. Life isn't always easy, but we are blessed with some wonderful memories... and oh, how we grow! Looking back, life has taken me in a different direction than I ever imagined or dreamed... and I am most thankful! I still have goals and dreams that I would love to see fulfilled that just haven't happened yet. 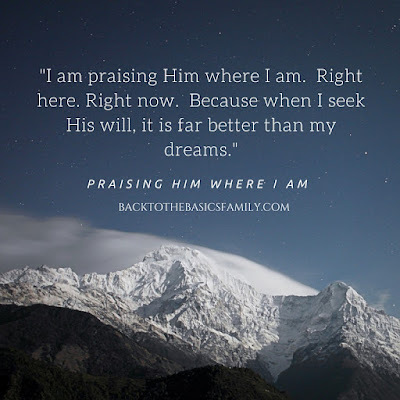 I am praising Him where I am. Right here. Right now. 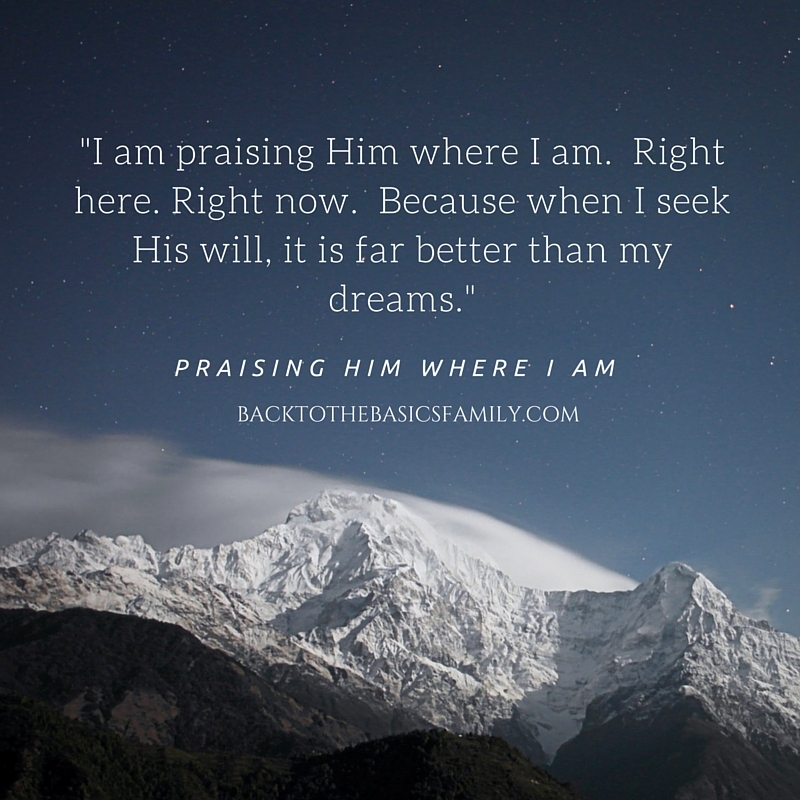 Because when I seek His will, it is far better than my dreams.